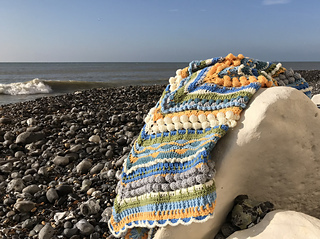 This is the Ravelry page for the ‘Changing Tides Blanket Crochet Along’ which will be hosted by Eleonora Tully from Coastal Crochet. It will begin on Friday 12th April, 2019 and run for 16 weeks. Eleonora has used the changing tides of the sea as her inspiration throughout the design process… from turning the blanket on each round just like the tides turn, to the different stitch combinations, textures and the colour choices too. The pattern will be released weekly on Fridays over on the Coastal Crochet blog and it will be free on the blog in both UK and US crochet terminology. The pattern will also be available to purchase as a PDF on Ravelry suitable for printing and this will be updated each week along with the blog.